In many ways, it is magic- the magic of gravity flow! At the base of the lock structure and immediately ahead of the lock gates is a large sized opening. The opening is protected with a metal grid (trash rack) which stops debris from entering the doorway. The water flows through the trash rack and enters a water tunnel (fill culverts) along both sides of the lock chamber. Water flow in the culverts or tunnel is controlled by the Lockmaster operating a control panel. The Lockmaster controls vertical movement (up and down) as well as the speed of a large metal plate (valve). The metal plate looks much like a flat bottomed wagon on iron wheels riding inside an iron Z track- thus it is called a “wagon wheel” valve. When the Lockmaster wishes to fill a lock, he simply raises the valve. The water gushes into the “fill culverts”. 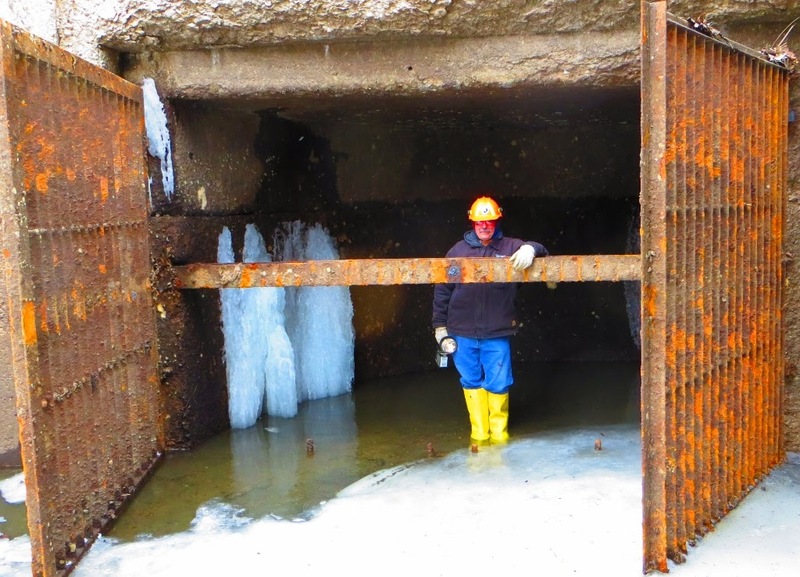 The water then exits the fill culverts through openings (port holes) at the base of the culvert and “magically” fills the lock chamber from the bottom up to the top! When the Lockmaster wishes to lower the water in a lock, he closes (lowers) the upper or intake valve. He then opens the valves at the lower end of the lock, and “magically” the water exits the bottom of the chamber through the port holes and flows into the canal. So how deep is the water in Lock E-27? A view of the inside of the lock wall shows not only the port holes from the fill culverts at the base of the lock chamber, it also reveals several water lines or areas: low, filled, and freeboard. When the water level is low, it is 12 feet above the sill- the same depth as the canal. When the lock is full or raised, it is 24.5 feet in depth- thus, the lift or “rise” in Lock E-27 is 12.5 feet! The area or footage above the top waterline to the land surface is referred to as the “freeboard” area. 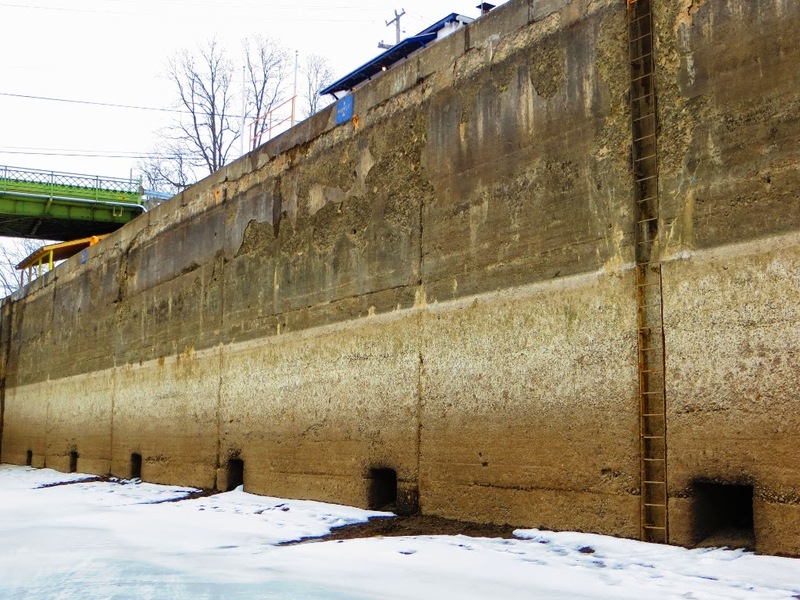 Lock E-27 in Lyons on the Erie Canal has been in full-time operation since 1918. Not much has changed since then- no electricity and no mechanical pumps are used to move water in or out of the lock chamber- it is all pure gravity flow- magic! Ironically, for all this magic performance, the Lockmaster uses the same control panel installed by the General Electric Company 100 years ago! 4 Comments to "Lock E-27 From the Bottom Up ~ Part II "